[float=left] [/float] Nakhon Ratchasima police have arrested a Nigerian man for allegedly duping a Thai woman into sending him tens of thousands of baht after leading her to believe he wanted to marry her. 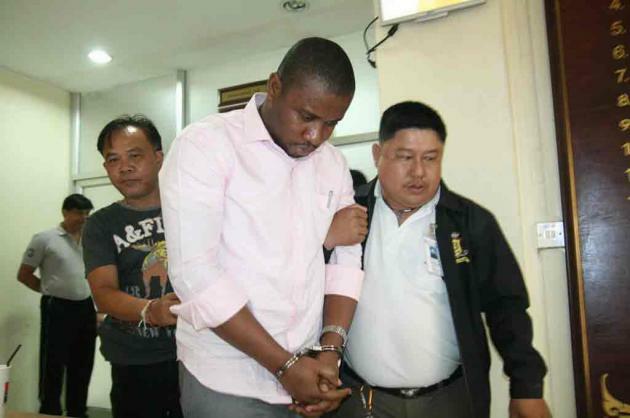 The arrest of Nigerian Smith Nnamadi, 34, at a Bangkok department store, came after a woman, whose name was withheld, complained to police that he had allegedly lured her to send him money under false pretences. The woman claimed that she knew the suspect via Facebook under name of Joe Henry, a British. They became lovers and Nnamadi proposed marriage after chatting via the network for two months. The suspect claimed he wished to bring in a Bt3million dowry but could not afford the fee of Bt321,560, so he asked her to help. The victim wired him Bt74,560 but Henry said he needed more. That made her suspicious and she turned to the police. A sting operation was set up at a local mall, where the Nigerian suspect came to pick up the money. The police investigation found that Nnamadi conspired with other foreigners to lure Thai women, wanting foreign husbands, via MSN, Facebook and online websites to dupe them into sending money. Police will hunt for his accomplices.